I have a waterfall feature with a water basin that holds 50 gallons of water or so. It was built 10 years ago or so and works fine, but now the sealer/lining is seeping to where I have to keep refilling the water once or twice a week. In reading your posts, my plan is to buy the Henry 4.75-Gal. 107 Asphalt Emulsion and spread that all over the area where water stands. garbage bag-like liner) is the problem. I also saw you mention Thoroseal. Is that better for my needs than the Henry 4.75-Gal. 107 Asphalt Emulsion? I have an above ground fountain that we put in as the centerpiece of a garden of raised beds. Construction is 24" high, 9' diameter ring of vertical Ipe 1x6 held with three hurricane strap bands. Within that is an EDPM liner with concrete bottom on top of liner. It's been up for a while and it looks as elegant as we hoped. I went around and pleated the liner at each joint in the Ipe (an elegant way to deal with the four foot larger circle of liner than pond diameter), but we are having trouble with small rivulets coming up an inch or more, and working through the pleats to come down outside the fountain. The fountain has been going down 1-2"/week, but we've just been using plumbing strap around the edge to hold the liner in place, and it seems to make the rivulets more numerous, if not slightly bigger as well. I'm thinking towards sealing the pleats down with something, but it would be really nice to have something that could be injected into the wet pleat, rather than having to take the band off to dry out the pleats. Any suggestions as to the best method of sealing this? > the pleats. Any suggestions as to the best method of sealing this? I kind of thought as much. Do you think there is a silicone or other caulk that would work, or would I be better off to open the pleat, put a piece of seam tape over the entire open width, and close the tape back on itself? It is at least outside, but even with Ipe not having water dripping down is a good thing. I read over the FAQs on your site but did not find an answer to my unique problem. 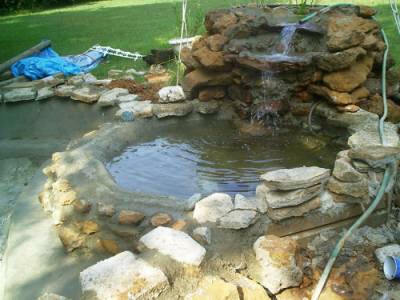 We have built a stream and series of small ponds on a area measuring approximately 22 ft x 22 ft. It looks great, but the problem is that it is built over wet ground. When we were in the construction phase we would be digging the stream bed and water would bubble up from underground. I tried to install a drainage system, but now find that water is collecting beneath the ponds and when we turned it off to repair a leak we also found that ground water leaked into the ponds themselves. We are considering cementing the entire thing in to be sure we have a closed system and leaving the ground water to find drainage as it would have naturally, but wanted to get an expert's opinion. Is there any other material other than cement that would also work?